All pendant chains can be shortened to any length desired, including choker length. Chain Length: 20" -Pendant Length: 3.5"
925 Solid Sterling Silver oval Rolo chain. Vintage West German Lucite diamond shaped opaque faceted bead. Vintage Lucite rectangle 'glitter' bead (not shown in photo). Large pink vintage Lucite oval bead with white swirls (not shown in photo). Dark rose Czech glass speckled faceted glass bead. Vintage faceted glass rose/pink 'Givre' bead. Vintage dark rose glass round with black swirl (not shown in photo). Pretty vintage Japanese pearlized square 'twists' (2). Olivine chips from Tunisia (2). Tiny vintage faceted glass Peridot bicones (5). Vintage Japanese glass Peridot/Aurora Borealis 'drum' Crystals (2). 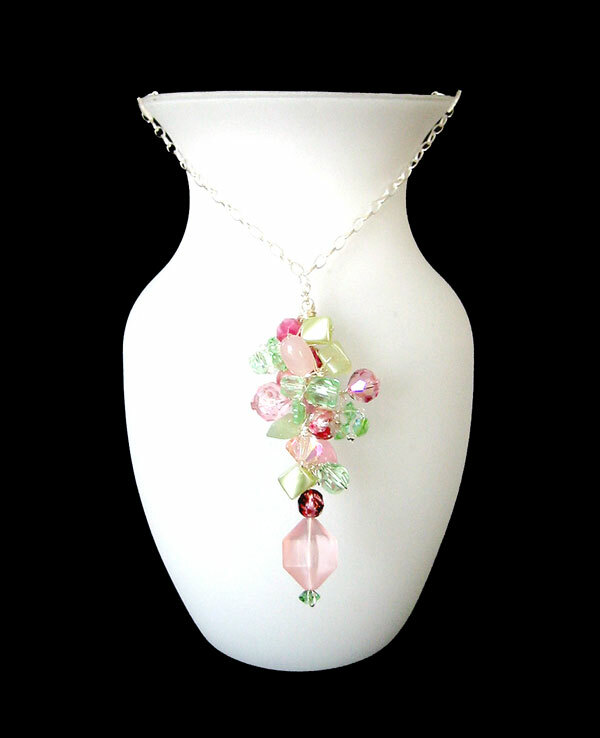 Vintage Light Rose/Aurora Borealis bicone and round crystals (2). Vintage German Lucite opaque oval. Vintage 1940's handmade Venetian Glass crystal round with applied rose 'drizzles' and silver foil inclusions. Vintage Swarovski Peridot/Aurora Borealis disc Crystal. Vintage 1920's Japanese glass green flower bead. Vintage faceted glass Light Peridot Crystals (2).